But it wasn’t an entirely normal day. Because of my interesting course plan (Mechanical Engineering and Theatre majors with a minor in Design), I have acquired too many too many hours for a normal student which has created some issues in my scholarships. I called a few offices through their general numbers to get help, but because of my unique scenario, I wasn’t getting the answers that I needed. I felt like I was spending all of this time and energy fighting for what I felt was right when I should have been working on my research, or homework or SOMETHING else. 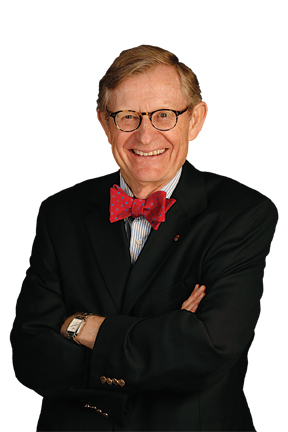 I was leaving work at Union Market and saw a small crowd around a jovial energy that could be none other than Dr. E. Gordon Gee. With the exasperation that I had felt that day, I figured that it couldn’t hurt to ask him for help… He says he cares about students, why not see for myself. When the photo frenzy around him slowed down, I asked him for help with my scholarship scenario and he listened and told me to send him an email to his personal email address to explain and remind him and that he would find someone to help. He may not be OSU’s official president anymore, he’s still TCB… Taking Care of Business. I sent him an email early Tuesday morning so it wouldn’t be bogged down in his inbox, and he replied early that afternoon with a short and sweet message and a pledge to get me in touch with the right person. By 2pm today, another email from Dr. Gee confirming that everything was resolved. I was thankful that Dr. Gee did help. I thanked Dr. Gee by email, but I figured I would put it out in the blogosphere as well. He has done a lot of great things for this university and continues to do so. I’m sad that when I receive my diplomas this spring that they won’t be signed by Dr. Gee though.